How do you create a video blog post? I have done it. I shot a video interview with myself and posted it to YouTube. 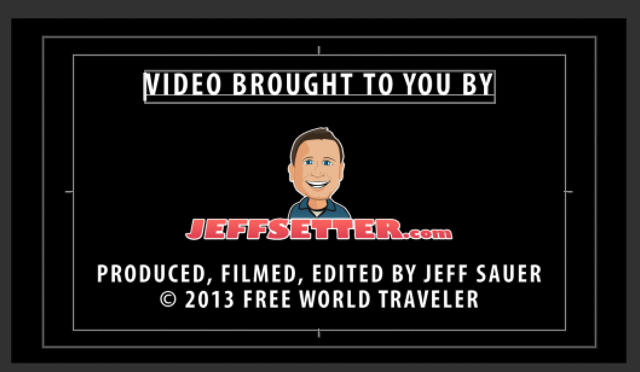 I guess that officially makes me a travel video blogger! For those of you who just want to get right to the meat, here is my first video, entitled Kia Orana from Aitutaki in the Cook Islands. For those of you interested in the video making process itself, here is some background. I have a degree in Electronic Media production that I don’t use at all professionally. Have really only used the skills once since college, and that was for my wedding video last year. Surprisingly, editing video has not changed much in the past 10 years. Sure, the quality is much better with HD video and the destination of the video has changed (mostly on the Internet now instead of on DVD), but the process of arranging clips together into a video is fundamentally the same. How did this video come to be? A lot of hard work and self discovery along the way. If you are interested in creating a video blog post, you have a steep learning curve ahead of you, so I have done my best to help you get started with this post. Here are some tips on creating video blog posts that I have learned while shooting the process. For me, the topic was the story of how I got to be sitting in a chair being interviewed on a random island in the South Pacific. Aitutaki is one of the most beautiful Atolls in the whole world, so much of the focus of my videos was just to film the beauty I was seeing. The actual act of shooting the video occurred when I was staying at the Pacific Resort in Aitutaki and it was raining outside. Since our Villa was detached from any common area, walking outside meant getting rained on. Rather than getting rained on, I figured I would shoot a video! When you are talking about a topic that is near and dear to your heart, you can start talking and everything generally flows pretty well. I recommend not writing a script for a video blog post, but rather thinking of a few topics that you would like to cover. 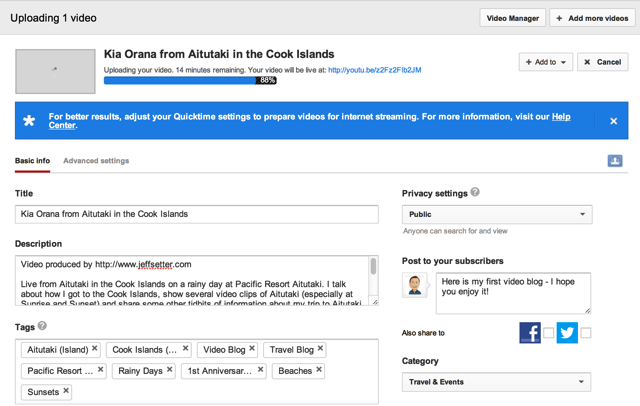 In my case, I chose to talk about how I got to the Cook Islands, what I was doing there and even about the timing of the video. That was enough to fill 7 minutes of time before trimming down! It may require a few takes to get it right and that’s totally fine. Memory is cheap, so you can store many video takes before running out of space; even while shooting in HD. One of the biggest things I learned in Electronic Media production classes was to film your surroundings to overlay as clips in an interview. Nobody wants to see someone talk directly for 3 minutes, so you need to overlay other clips to break up the time. Now I think 3 minutes is probably too long for a video, but it seems to go by faster when you have other visuals to see along the way. 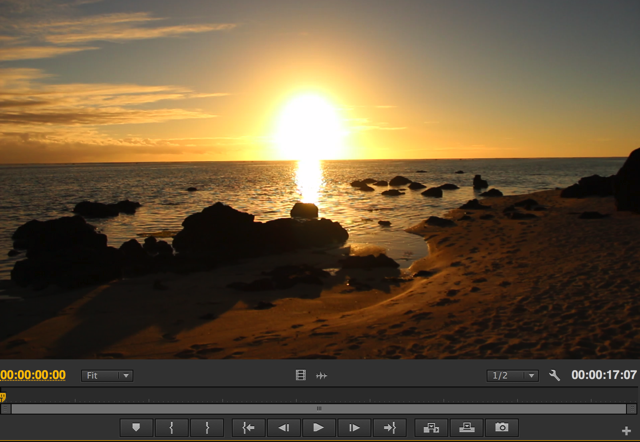 Take your clips and your interview and import them into your video editing software. You can use something as simple as iMovie or more advanced tools like Adobe Premiere Pro or Final Cut Pro. I used Adobe Premiere Pro for this video, but don’t have a strong recommendation either way. Most tools are fundamentally the same (but do have a wide range of features and price differences that you should research before purchasing). If you have never edited a video before, this will be the hardest step because there is a learning curve that you must go through. Even if you are a pro at video, it generally takes about 30-60 minutes of editing to produce a minute of finished video. Sometimes even longer! Video interviews shouldn’t take that long when you get good, but be prepared to spend at least an hour on a 3 minute video. Most video software comes with pre-set video titles that look like something from a 1980’s corporate sexual harassment training video. Maybe these will fit your needs, but I ended up creating custom branding for Jeffsetter. It’s really just a transparent PNG of my website name and some text on a semi-transparent white background. Nothing too fancy but looks good enough for my first video. You will want to do the same thing with the credit sequence as well. I recommend putting your website URL in your video early and often, because if someone discovers you on YouTube (second largest search engine in the world), they likely will not know that you have a website. Make your website your call to action! 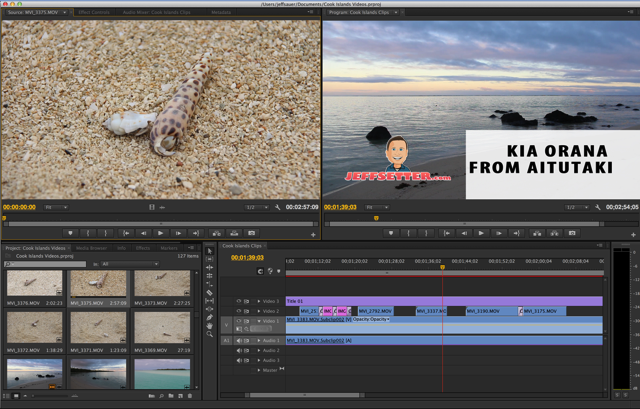 When you are satisfied with your video, export your finished video into a single, compressed file. This will probably be several hundred megabytes when done and you will want to compress as much as possible. I am still trying to figure out the best compression methods myself, so I don’t have any strong recommendations for encoding videos and what compression technology to use at the moment. If you want to make sure that search engines can best find your video, it is imperative that you have your videos transcribed. If you think about it, how else would a search engine know what your video was about if you did not provide them with text and a solid description? This is something that can be done fairly inexpensively using a third party service. When done, embed the transcript on your blog post and attach to the video file. To get maximum exposure for your travel blog post, upload to YouTube at the very least to take advantage of search traffic coming into your site. You may also choose to host your videos on premium providers like Vimeo and Wistia, which have benefits as well. You may choose to start with just YouTube, though, because it’s free and widely accepted! Whether you are using YouTube or a more SEO optimized video platform, make sure to embed the video on your website in blog post form and write a custom introduction to the video. Below the video, also include a transcript of the video for search indexing. Bonus: If you are going to do a lot of videos, then you must also check out the Video SEO plugin by Yoast. This plugin makes sure your videos get rich snippets, creates a video sitemap and does all kinds of other meta data tweaks that make sure your videos are properly indexed by Google and other search engines. Don’t forget to promote your video once it’s done. There is nothing worse than spending days/weeks/months on creating content and having nobody view it. Make sure that you work hard to promote your videos so that it can reach the widest audience possible. Your blog visitors are one audience, but you also will want to try to make sure you show up in video search results on YouTube and on Google itself. Share with your social networks and if it’s a great video, perhaps you should try some paid promotion as well? Video inventory on YouTube is very inexpensive! Video takes time to create, but opens up many doors for your website. While I am specifically talking about what I did for my travel blog, these principles are useful anywhere you go. Producing video is a great way to get new readers/visitors to your site, raise awareness and even become a more recognizable figure than from blog posts alone. When you produce video on a consistent basis, many of your readers will have a stronger connection with you and get to know your real personality. This can be a great way to build loyalty to your website and introduces you to a large audience of people who prefer to consume information through video.